There are a few growing pains that nearly every growing company eventually encounters. A line starts to form at the old entry-level laser printer; the coffee pot is empty within minutes of brewing; the fridge runs out of space. Likewise, every company eventually outgrows their off-the-shelf WiFi router and learns that operating a high speed, secure and reliable WiFi network for an office or restaurant space is a big job. Choosing a managed WiFi provider is the easiest way to solve the problem, and get back to the business of… business! Instead of stressing out and troubleshooting internet issues on your own, let a managed WiFi operator, provide peace of mind. Here are some reasons why managed Internet is the best choice for common areas in apartments and condominiums, restaurants, small offices, and even large enterprises. Contracting with a managed WiFi provider grants you access to a team of people who specialize in accelerating the productivity of your business. Technicians and engineers will visit your site and perform a survey of your company, complex or campus. 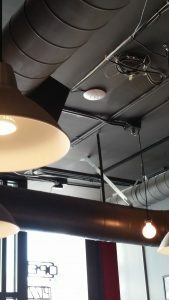 Based on the space, building materials, neighboring frequencies, and your specific needs, a managed WiFi provider designs custom solutions, providing seamless connection coverage of your entire space. When you work with a managed WiFi provider, they can easily add additional access points to accommodate the growth or expansion of your business. In the early planning phases, this might mean planning extra cable drops for future growth; in retrofit scenarios, it might mean figuring out how to fix that one office in the corner that does not get a good signal. Your managed WiFi provider is your on point team, here to strategize and build a network that covers everyone, is flexible and efficient, and that can grow to meet your needs. When you choose Atlas as your managed WiFi provider, we stay on top of things – so you do not have to. Atlas monitors your network from our Network Operations Center (NOC). It is our job to monitor your connection, down to each individual access point, ensuring peak performance and speed. When there is an outage or problem, our NOC detects it right away, notifies you, and begins troubleshooting to fix the issue as quickly as possible. With technology in a continuous state of evolution and improvement, software upgrades are a constant, and something that can disrupt a system if not handled appropriately. As your managed WiFi provider, we will do the work to keep your infrastructure up to date, helping you stay connected in an ever-changing device landscape. Whether you are a small business or a large enterprise, when the internet goes down, it is disruptive. With the growing popularity of cloud services, the importance of internet access has become so great that many businesses simply cannot run without it; and disruptions translates to lost dollars. Consider the potential for lost revenue and the opportunity cost of lost productivity. Avoid the trap, and rely on experts who have dedicated their professional careers to understanding the ins and outs of internet connectivity. As a managed WiFi provider, Atlas employs technicians and engineers with years of experience under their belts, who are on top of the latest changes, and who are old hats at troubleshooting. We typically become aware of issues before our customers even notice them. Atlas has a track record of developing meaningful relationships with our clients based on trust and reliability. We are also a licensed low voltage electrical contractor who can assist with wiring as well as internet connectivity. Our engineers can also install a network firewall, ensuring there is a secure barrier between your network and unwanted, dangerous internet traffic. Similar to a managed WiFi service, we monitor the firewall’s performance, configurations, and maintain equipment. When you choose Atlas as your service provider, you get more than an internet connection; you get an ongoing conversation with friendly, local experts who always have your back. Are you interested in making the switch to Atlas Networks’ managed wireless service? Contact us anytime, we’d love to learn more about your business and identify how we can help! Atlas Networks Wins TINYaward for Happiest Company! Atlas Networks was founded in 2008 in Seattle with the vision of providing fast, secure Internet while maintaining elite customer service. We bring homes and businesses fast, reliable Internet service from a provider they can trust. Headquartered in Belltown, in the heart of Seattle, our local team of technology experts helps businesses large and small take the guess work out of system operations by increasing efficiency and reducing costs.